According to a leak obtained by Forbes, FreedomPop, a company that's looking to provide free, mobile Internet access, is now looking to tablets as its next broadband market-disrupting frontier. 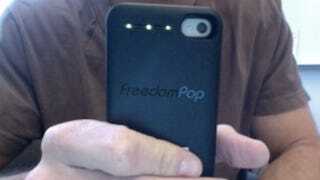 Would You Put a Case on Your iPhone If It Gave You Free Data? Dubbed the LTE Clip, the relatively unobtrusive device will attach to Wi-Fi-only tablets, granting them LTE Internet from Sprint Nextel in the process. Wi-Fi-only tablets already take up 90% of the market, and the LTE Clip is supposed to be compatible with the vast majority of them (iPad included). So for this significant group of tablet users who don't want to pay for a data contract, a free 500 MB of 4G service per month could be a highly appealing deal. Users will get additional free data whenever they share their connection, and up to eight users can connect to a clip at a time. So it helps to play nice.